Green smells and taste different as compared to regular tea! This is due to the reason that the leaves are processed differently to make a green tea, as compared to regular ones. Taking a cup of green tea everyday shall help in boosting immunity and your system, enabling you live happily with better health. Studies also show that drinking certain teas like green tea daily can help in relieving breathing issues and allergies in patients. However this does not always hold true in all the cases! What Kind Of Tea Is Good For Asthma? How Does Green Tea Help Asthma? Does Green Tea Induce Asthma? Breathe Easy Tea for Asthma: Is It Any Good? How to Prepare It At Home? Green tea is one of the best options when it comes to consuming herbal teas. An ideal way to gain health benefits from green tea is by sipping it daily. Unlike other hot beverage like regular tea or coffee, green tea can be consumed any number of times in a day and shall not induce any negative effects in your body. In case you do not like the taste of green tea then you could always go for flavoured herbal ones or alternates to green tea that are equally healthy as compared to normal green tea. Note: Avoid drinking eucalyptus tea as it have pungent aroma which can irritate your bronchial airways and trigger an attack. These teas are proved to be highly beneficial for relieving breathing problems such asthma, copd, bronchitis, etc. These are now available online and also at health care counters where you can get them for daily use. The concept of consuming one or two cups of green tea is gaining positive response these days for the various health benefits it provides. You would be glad to know that if you are congested or have mild asthma then the warmth from green tea can help you breathe easier. Green tea has caffeine called theophylline which is a mild stimulant. It helps in removing congestion and dilate bronchial tubes in the lungs. It is indeed a fact that medicines suggested for cure of asthma has theophylline as an important ingredient in it. Therefore consumption of green tea on a daily basis can help a lot in relieving the mild respiratory issues caused due to asthma and allergy attack. However this does not mean that you should be drinking tea in place of a fast-acting inhalers for treating your condition. Although there are no concrete proofs which does guarantee to reduce chronic asthma attacks in humans, it shall be possible for you to enjoy short term benefits when you drink green tea. While people have been harping on the health benefits and how green tea could help combat asthma attack to certain levels, there are also various opinion came up on the fact that green tea could actually induce asthma attack in a person. While green tea does not guarantee cure to asthma, certain ingredients used in its making process can increase risk of asthma attack in a person. However this condition varies from person to person. It is always better to consult a doctor before the consumption of green tea as it is important for you to be sure that there are no ill effects induced through consumption of tea. In fact Breathe Easy Tea is considered one of the best tea for breathing problems and congestion from hay fever colds and allergies. This herbal supplement tea is enriched with highest quality pharmacopoeia grade herbs and ingredients which includes licorice, eucalyptus, peppermint and fennel. These ingredients used are completely Organic, Kosher, Non-GMO, caffeine free and certified. 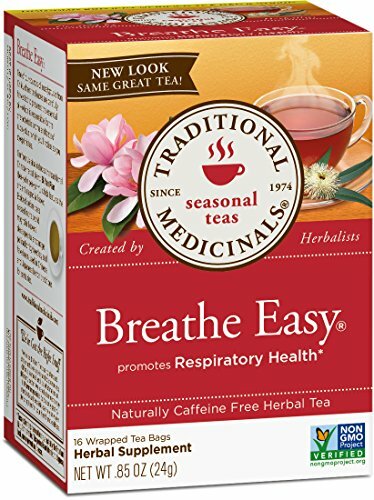 Breathe Easy Tea for asthma and bronchitis has been helping people for nearly four decades by promoting their respiratory health in all seasons. Its bittersweet taste with hints of aromatic citrus blend gently shakes your senses and lets you breathe easy when you are feeling bit congested. Preparing Breathe Easy Tea is very easy at home. You just need to pour about 8 oz. freshly boiled water over 1 tea bag. Then cover the cup and allow it to steep for about 15 minutes. Now just squeeze the tea bag completely to get maximum goodness of the tea in your cup. You can enjoy up to 3 cups of tea daily without any side effects. It tastes even better with a bit of honey, so do not forget to try the blend. Although the tea relieves the symptoms related to cold, flu, or chest infection, it is found to be risky if consumed in higher quantities than as recommended. Some of the common side effects of the tea may include (if consumed in excessively): anxiety, mood swings, immune suppression, decreased bone density, sleeping problems, nausea, vomiting, diarrhea, etc. People with health conditions such as high blood pressure or heart disease are also not recommended to consume this tea. Before drinking herbal teas like these, it is best to consult your health practitioner, especially when you are suffering from certain health conditions or are taking the medications. Although the tea is available at all leading grocery stores online, we recommend you to buy it at Amazon which is your best one stop solution for all the needs. Not only you get the best genuine product but also you can expect to get the right price along with various discounts that are offered from time to time.